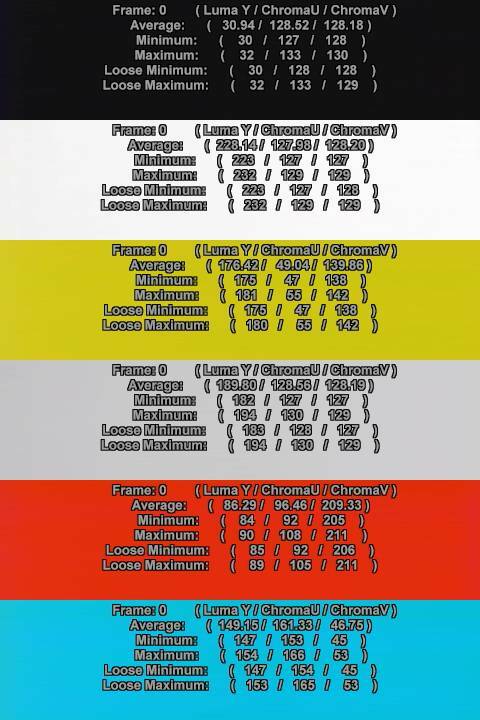 This guide is intended to help those of you who are capturing analogue sources (from laserdisc, in the main) to ensure that the colours in your digital capture match your analogue source as close as possible. The method is strictly a numbers-based calibration of your capture chain, it is not intended to help you get "natural looking" skin tones or any other subjective outcome. Step 1: Capture a test pattern off a laserdisc. These patterns may be found on blank unused sides, or in special set up chapters. There are also discs that are dedicated to such set up patterns, such as A Video Standard or Video Essentials. There is a work-in-progress list of laserdiscs that contain test patterns here. Play your laserdisc, and capture the test pattern. Some capture cards let you adjust capture settings such as brightness, contrast and saturation, other capture devices (such as Firewire units or DVD recorders) do not give you this option. If you do have these adjustments, you can set your card up to be approximately correct (but be careful not to clip anything), then fine tune the result using the AviSynth method below. Rather than try and read individual pixel values, it's useful to crop out all other bars so you're left with a frame containing just one colour, then use ColorYUV(analyze=true) in AviSynth to find the average YUV values. It shouldn't matter too much which six colours you choose, but I'd recommend you include black, white and at least one grey to help with the gamma setting. The colours in the test patterns have exact specifications. 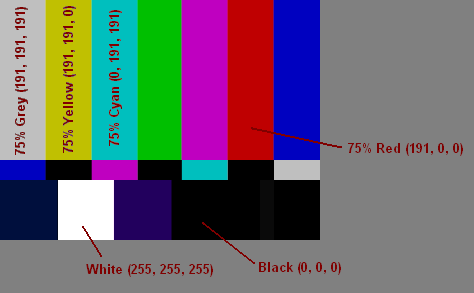 We know, or can work out, exactly what RGB (or YUV) values represent each solid colour block. 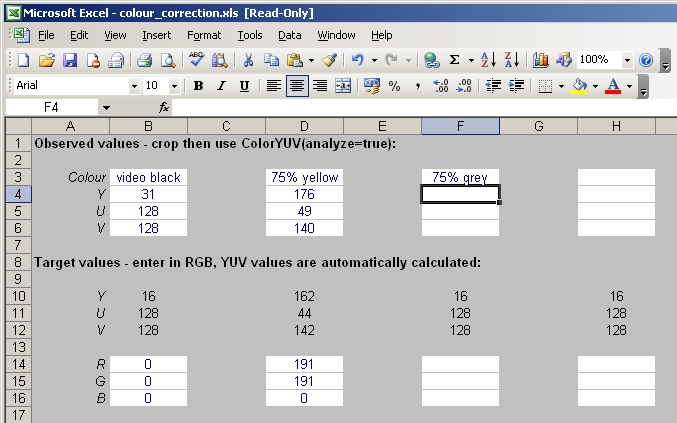 Download the Excel spreadsheet here, and complete the observed and target colour values. Provided your colours are close enough in the first place, and you haven't made an error in entering any values, Solver should stop after a while with a solution. Thanks for this excellent information! Can we do something similar for VHS? 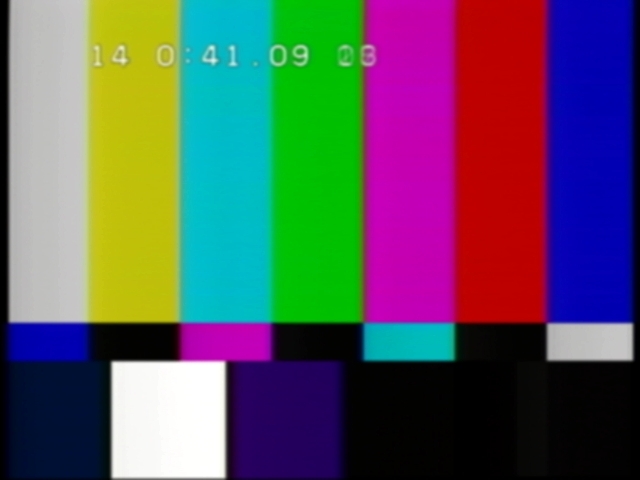 Of course... you just need to find a VHS tape that includes the colour bars. I don't think I've ever seen one, but apparently some releases did have the bars at the start or end of the tape. Steps 1 & 2 now completed. Guide now finished. Please give it a try and let me know if you come across any problems. Uploaded spreadsheet v1.1 which corrects an error where I had accidentally overtyped some of the formulas. Did you use this method for your French THX LD captures? No, I only came up with this idea relatively recently. Besides "Jason and the Argonauts" PAL UK LD, are there any other PAL laserdiscs which contain some test image or color bars? 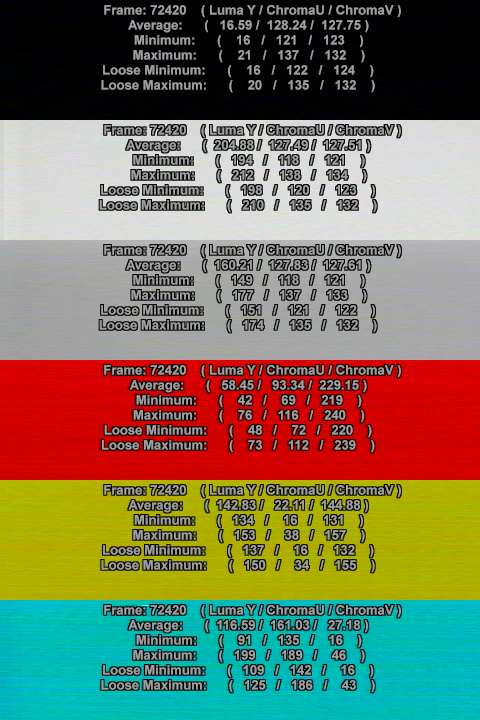 now that we have proof that PAL CD-Video can't show 460 lines of horizontal resolution - what a discovery! - maybe only the first test could be useful; take in account that it has laserrot and so is full of speckles and dropouts, but the colors are still vibrant. 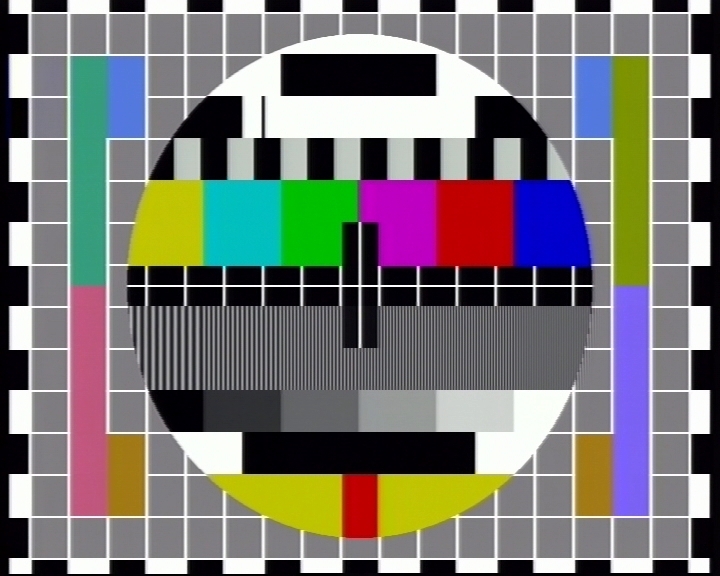 Did you make an AVS script like the one you posted, but for use with the BBC testcard G? Good question. None that I know of. Interesting disc. I don't know much about the CD Video format, but I think you should be able to use this disc to calibrate your LD captures. Is it NTSC or PAL? Do you have any further information about this disc? Despite the fact the video is awful due to laser rot, I think it can still be used as calibration tool. If you can send me the AVS script, I'll do tests with it and post results here. If you can send me the AVS script, I'll do tests with it and post results here. You will need to remove the leading "#" for each line and note down the stats for each colour in turn, and you may need to adjust the crop values if your capture is positioned differently to mine. 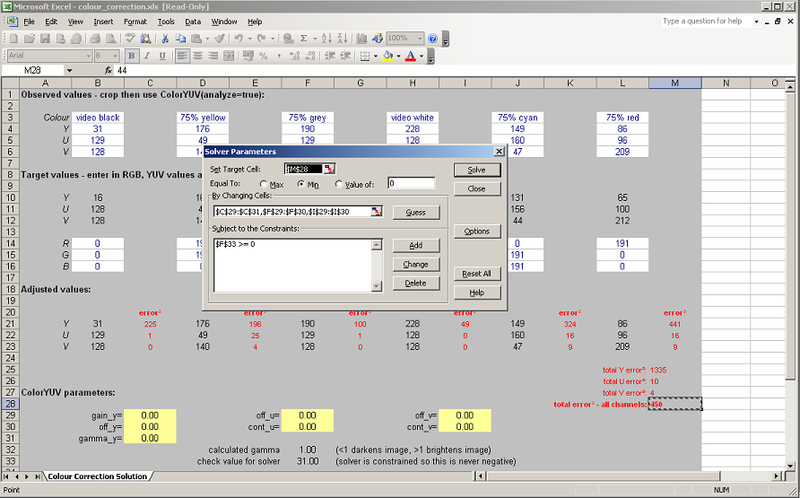 Spreadsheet updated to v1.2 - fixes a problem where Solver would sometimes fail due to a #NUM! error. Added some example screenshots (right-click - open/view image in new tab to see full size). Now I just need to find a VHS with color bars! Modified crop code for the mid-90s Fox bars. Very impressive! Thanks. Even with this noisy disc. Though I think I should recapture to get more shadow detail. I need to recapture for better audio anyway. Same $20 capture device as above with same capture settings but different disc: A Video Standard. Same frame, different capture device: ATI 600 USB. I'm trying to figure out whether it's better to capture somewhere close to where I think the levels should be by eye, and risk crushing or blooming detail, or constrain the range so that it definitely fits within the ends of the histogram, for later expansion with the Excel function. Bars here from Visions of Light. Both captures are using the ATI 600 USB. The first is with high brightness and low contrast (dull image) and the second is with lower brightness and higher contrast. My attempt at approximating the appropriate values didn't go over too well due to the laptop monitor that I was using. For some reason it causes things to look way off. The dark blue bar and dark purple patch seem to show the biggest differences. Beyond that I'm only seeing noise shifts. I don't know which is better, but at least I'm satisfied that there isn't a huge difference either way. 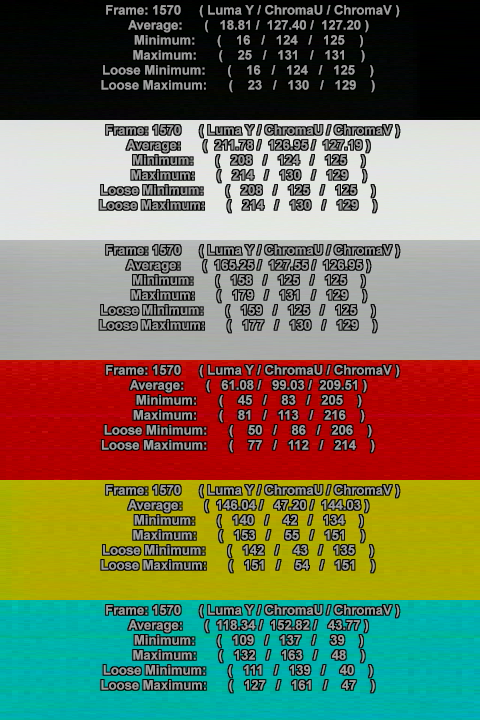 Looks like my approximation didn't leave enough play at the low end to avoid clipping below-black. I visited a thrift store recently and bought an intriguing tape that was hand-labelled. It turned out to be someone's 4-minute student short film, with bars and tone at the head. But it wasn't the master copy. The 1kHz tone sounded way lower, colors are faded, contrast is poor, and blacker-than-black in the bars is already clipped no matter how high brightness was raised in the Proc Amp. I tried to use the bar's values anyway but they were WAY off and produced both crush and bloom in the content itself. You could use a signal generator and record the colour bars to the VHS deck you will be using for captures. No, that won't help at all. If the only thing that you needed was to record color bars on your playback deck, mastering houses wouldn't record bars at the start of every tape they put out. Their clients could just calibrate their playback equipment once in the way you describe, instead. There was an S-VHS calibration tape released in 1989: Perfect Picture System. If it could be located, it would at least be somewhat useful for calibrating professional VHS recordings. I have happened upon a retail VHS tape that has tone + grey once the program content ends (there is a long period of black before it drops off to this test signal, so I take it to be an artifact of the duplication process). I also found one with tone on black at the end but that's pretty useless. I'd like to calibrate my Hauppauge USB-Live2, but the proc-amp controls range from -5000 to 5000. I have 20/20 vision, but my eyes aren't that good and the auto-calibration that comes with DScaler works, but looks like it'll take forever to complete.